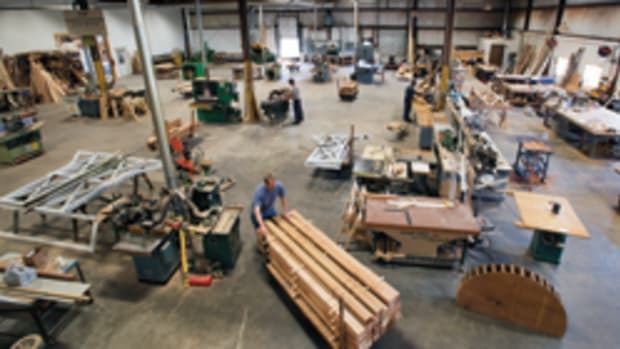 Kent Merrill, owner of Merrill Woodworking in Rigby, Idaho, and featured in this month’s cover story, makes the point that part of his business success depends on how well he keeps up to date with the latest designs and innovations. Merrill puts an emphasis on mentioning the latest hardware products to his clients, which, in turn, makes them appreciative of his knowledge about the various slides and hinges on the market today. 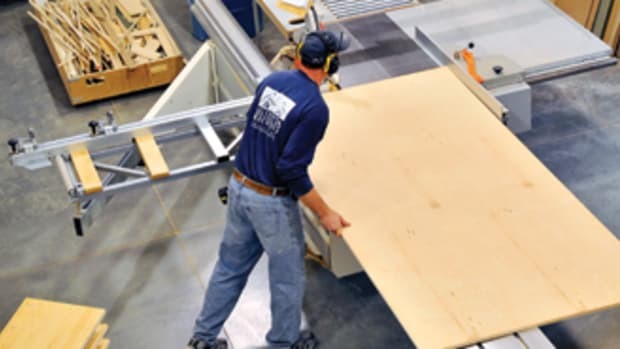 Year after year, trade show after trade show, it seems there are more and more slides, hinges and other functional cabinetry hardware systems that improve the quality of homeowners’ lives. Many of the products listed below were found at the recent IWF in August and more selections will be added in July at the AWFS fair in Las Vegas. Source list For products listed in this story, contact the following companies: • Accuride International. Tel: 562-903-0200. www.accuride.com • Blum Inc. Tel: 800-438-6788. www.blum.com • Cabinetparts.com. Tel: 800-857-8721. www.cabinetparts.com • CounterBalance. Tel: 215-957-9260. www.cbal.com • Hafële America. 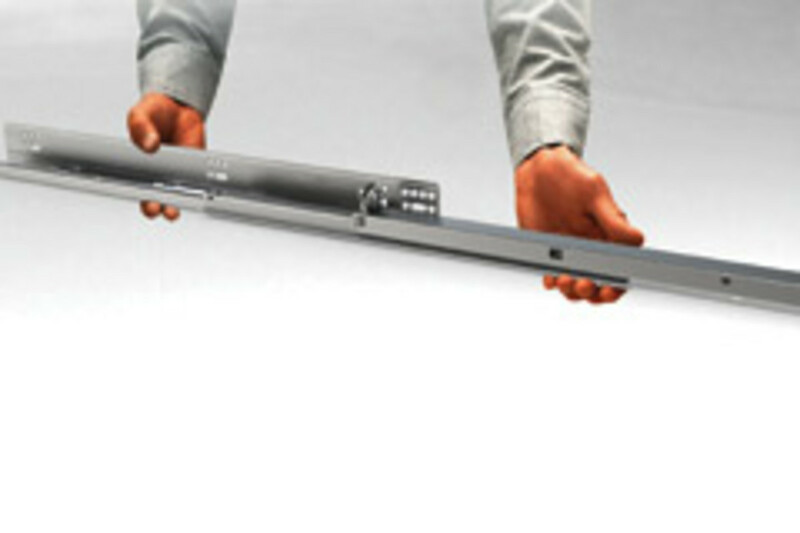 Tel: 336-434-2322. www.hafele.com • Hettich America. Tel: 800-777-1772. www.hettichamerica.net • Rehau. 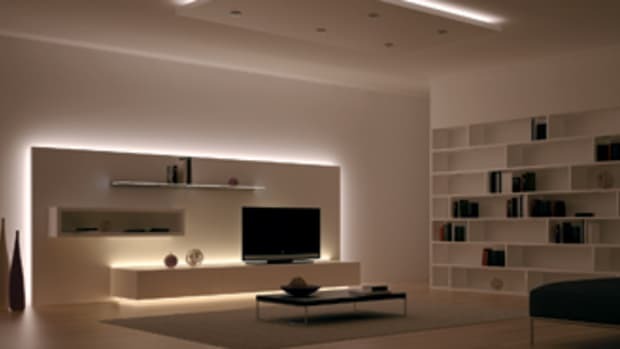 Tel: 800-247-9445. www.rehau.com • Rev-A-Shelf. 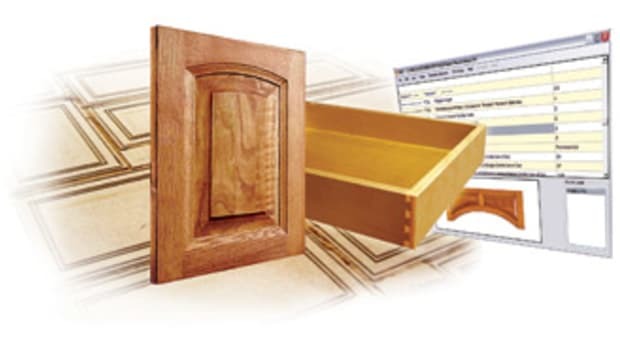 Tel: 800-626-1126. www.rev-a-shelf.com Information on hardware suppliers and distributors is also available from the Woodshop News’ online resource directory at http://resourceguide.woodshopnews.com. 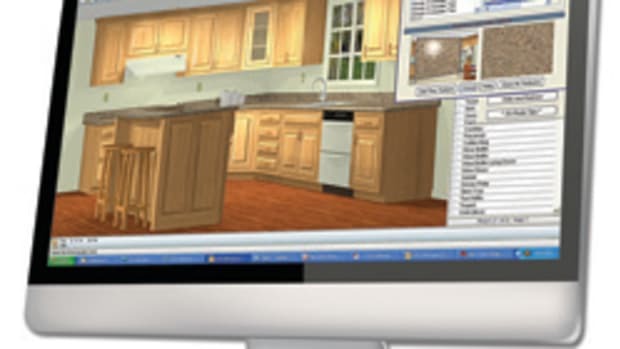 Through the years, Pat Abbe, owner of CabinetParts.com, an Internet-based hardware supplier headquartered in Pompano Beach, Fla., has seen consumer trends fluctuate greatly in this product category. He says that, lately, consumers have been leaning towards soft-close hinges and drawer slides that are designed to keep households quieter. He works with a number of leading manufacturers whom he says do extensive research on consumer preferences, so their latest products usually reflect the current trends. Another recent trend he notices is that many of the newer products are geared towards the aging baby boomer population. “The trends I see in new construction are starting to go towards corner drawers instead of Lazy Susans. 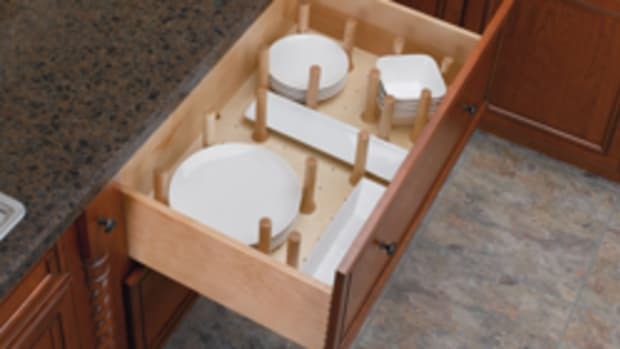 Especially as we age as a population, we seem to be getting away from base cabinets; everybody has a corner system tandem box. These manufacturers do a lot of research on who’s buying the product and the best use of space. I see that as a trend. Nobody likes to bend in and reach the back of the cabinet. 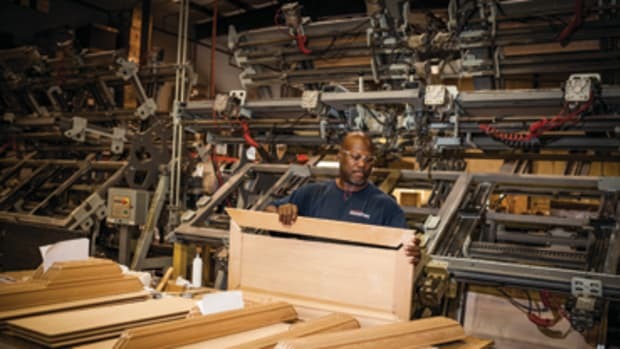 Now everything is coming to us, so rollout drawers work really well,” he says. Accuride International recently introduced model 3600, a new heavy-duty slide option for the woodworking industry. The product offers full extension, includes a hold-in detent and carries loads up to 200 lbs. It is a non-disconnecting slide, which is useful in applications where heavy drawers are not intended to be removed from cabinets as a measure of safety, such as in medical or educational settings. Designed for drawers up to 42” wide, model 3600 is available in even lengths of 12” to 28” in a clear zinc finish. It is designed for wide drawers and trays, bulk storage bins or pullout shelving units in commercial and residential environments. The company also added models 7950 and 7957 to its heavy-duty slide lineup. These slides offer an alternative for 3/4” side space projects, giving woodworkers additional slide options for drawers with larger loads, says the company. Accommodating drawers up to 42” wide, these products are suitable for applications including kitchen storage for small appliances and cookware; or garage and shed storage of paint and tools. The slides are full extension and carry loads up to 350 lbs. They can be mounted flat at a lesser load capacity of up to 150 lbs. per pair. Both models are available in lengths of 12” to 36” in a clear zinc finish. Blum is launching its next-generation Tandem plus Blumotion drawer runner series this month. Several features have been incorporated into this new series. The company has added a side-adjustable locking device as an option for inset drawer applications, screw holes in the bottom of the runner for bottom mount applications and elongated holes for easy depth adjustment. The series offers users increased stability, the ability to use all the same rear mount brackets and a lateral stabilizer option for wide drawers. 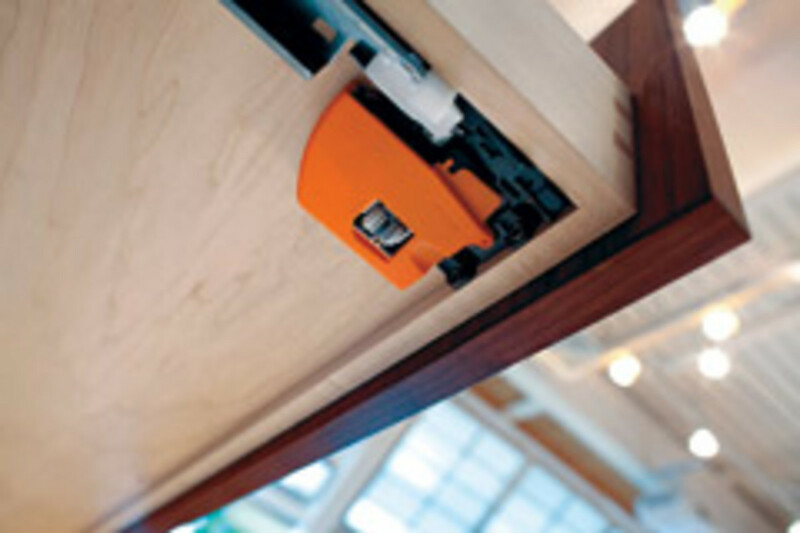 CounterBalance offers a unique spring-loaded device called Lift-A-Syst to balance hinged countertop doors. The product works by using flexible rods that store mechanical energy when twisted. The torsion is applied to the rods as the countertop doors move in an upward or downward motion, neutralizing the weight of the countertop and making it virtually weightless while in motion. The product is available in six different sizes to accommodate different countertop door lengths and weights and can accommodate ranges between 21” and 39”, and weights from 22 to 72 lbs. 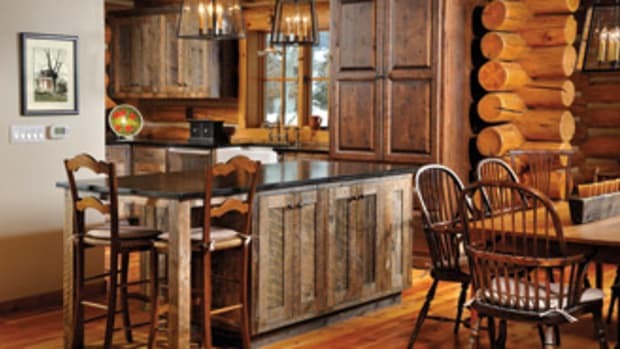 The company also offers a custom product line for countertop doors called the Counter-A-Syst counterbalance. Hafële offers the new SmartCab Storage System for a wide range of functionality in the kitchen. It is an interchangeable storage system that offers a wide range of inserts that make it fully customizable without requiring a full height door. It can be custom-configured to fit into a standard 15” or 18” base cabinet with a door/drawer configuration. Hettich America recently launched the Grant E-Series sliding and folding door hardware systems. These products cover solutions for bifold and multifold applications from 25 to 150 lbs. per panel. 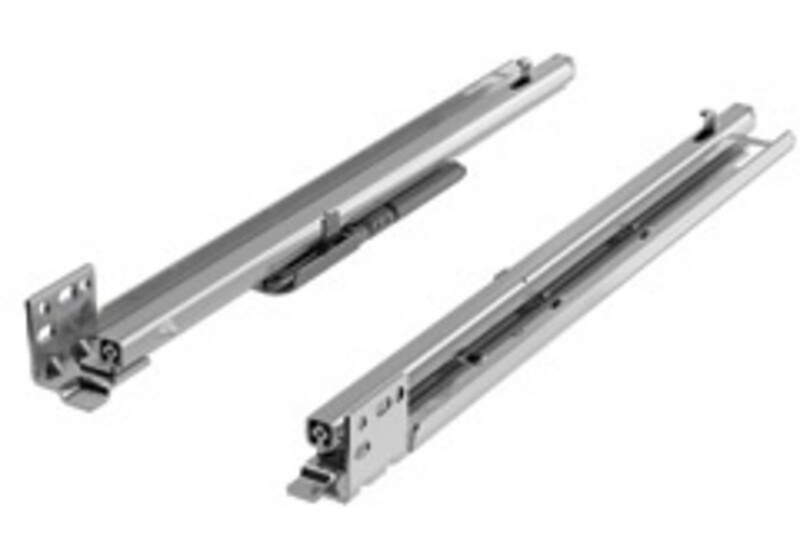 They also offer sliding solutions for single, pocket, bi-parting and bypassing applications. 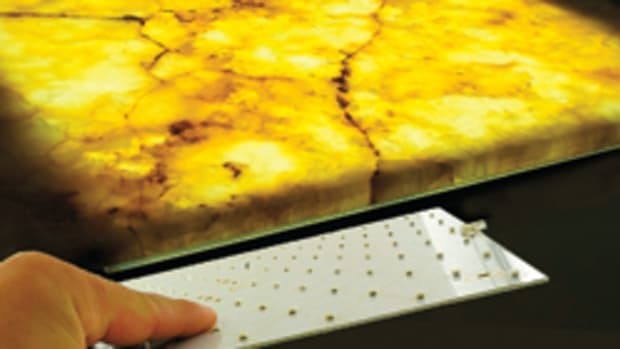 These systems feature an aluminum box track that hides the hardware for a clean appearance. The carriers feature high-quality precision bearing wheels that deliver a smooth, quiet and long-lasting performance, according to the company. 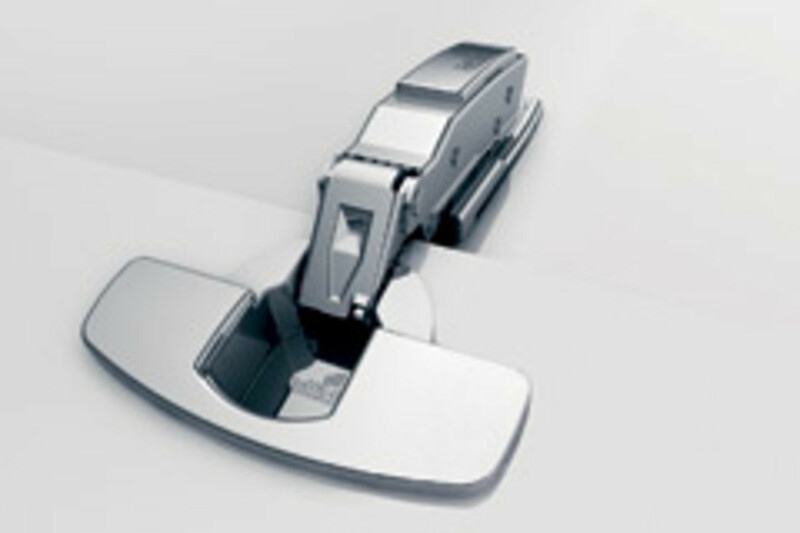 Hettich also introduced the new full-access Quadro, an updated version of its popular Quadro slide. The slide features a minimized extension loss compared to a full extension slide that provides 15 percent more access than a partial extension slide, making it and attractive option for upgrading furniture lines, the company says. Hettich has also updated its Sensys hinge with an integrated Silent System that allows for soft closure of furniture doors from an unusually wide opening angle of 35 degrees. Rehau offers a selection of innovative tambour door systems that suit a wide variety of market applications, with customization options to match size, design and finish preferences and to fit a variety of horizontal and vertical openings. They require minimal space and provide full access to the cabinet contents, unlike sliding doors or hinged doors that open out into the work area. An unlike wooden doors, the durable polymer systems do not swell or stick with humidity. Rehau’s Vetro Line tambour door system addresses modern kitchen design trends that incorporate glass doors and translucent materials. 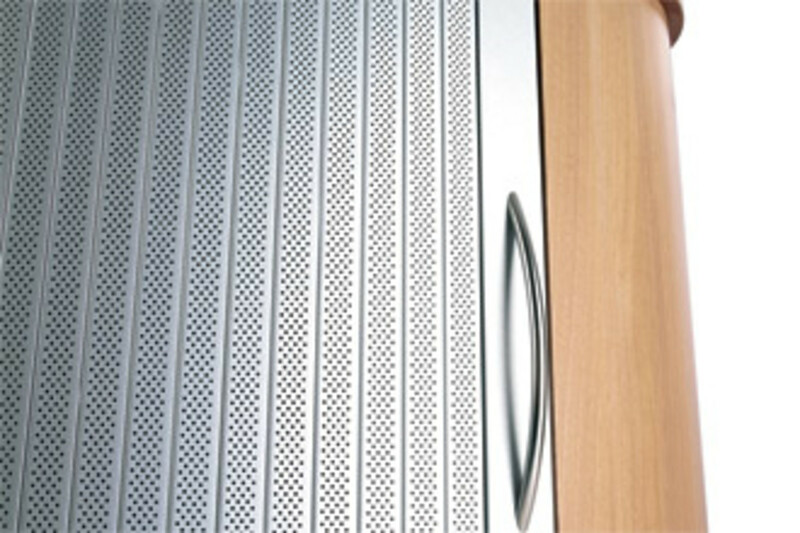 The line combines the tambour door cassette system with 2” heat-tempered security glass slats, offering a sleek, translucent door solution for a wide variety of cabinet applications. The complete line also now includes clear, black and white color options. Rehau also offers the appliance garage tambour door kit as part of its Express Collection stock program of edgeband, tambour door systems and related accessories. The complete and ready-to-install kit provides visually appealing countertop storage that offers convenient access to frequently used kitchen appliances. Rev-A-Shelf is offering a new soft-close wall pullout, the 448 WCSC series, to enhance cabinetry accessibility in the home. This adjustable shelf wall pullout features Blumotion Soft-Close slides. Designed for 9” and 12” wall cabinets, these pullouts come complete and ready to install in existing cabinetry. Product highlights include adjustable shelves with stylish chrome rails and removable top rails that provide another shelf for taller 36” or 42” applications. Another new product illustrates Rev-A-Shelf’s many new drawer systems designed for better kitchen organization. The 18” two-tier knife drawer with soft-close, W4T Series, is packaged in a kit with Blumotion soft-close slides for smooth and silent operation. A drawer-front needs to be added to complete the system. 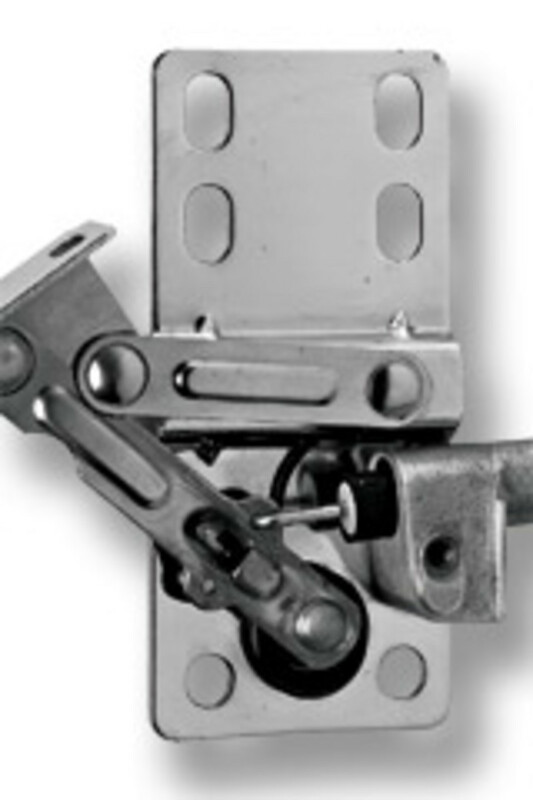 Rev-A-Shelf’s soft-close tipout hinge, the LD-0220 Series, is designed for use with all of the company’s tipout trays. It features a soft-close piston that eliminates slamming and a 50-degree opening that allows for complete accessibility to items stored within it.